With taglines like “We Are Not Authentic” and “Normal Is Boring, Be Different” we knew we were in for something special when we rocked up to Eat Me Ramen Bar for lunch on a cold, blustery Friday. 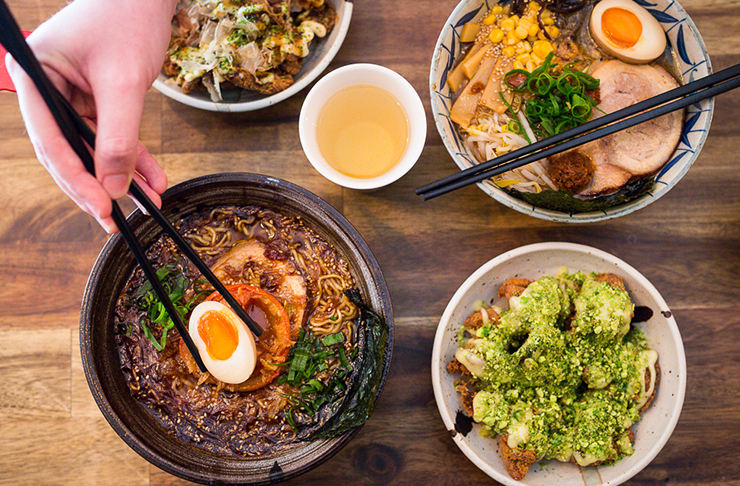 A teeny-tiny space off Barrack Street in the Perth CBD, what the Japanese ramen bar lacks in size it makes up for in flavour, serving some of the most taste bud tingling noodle soups we’ve had the pleasure of slurping down in a long while. Case in point: The Umami Bomb ramen. Chock full of chashu pork, bamboo shoots, wood ear fungus, sweetcorn, spring onion and crispy shallots, the base of this bowl is made up of a house blended miso and super rich chicken broth, and it’s topped with the savoury goodness of an XO bomb and umami butter. Pure genius. Then there’s the Midnight Sun ramen. Its house blended soy sauce and rich chicken broth are the perfect accompaniment to the pork chashu, smoked roasted tomato, seasoned egg, beansprout, bamboo shoots, wood ear fungus, spring onion, chilli bits, crispy shallots and burnt garlic oil found floating happily inside. Now, let me just pause for a second and have a little moment with the pork chashu. I’m not a huge fan of the pork belly regularly found in ramen soups as I find it to be fatty and a little too slippery for my liking. The pork chashu cooked up at Eat Me Ramen Bar is none of those things and 100% delicious. It’s tender, juicy, cooked overnight with plenty of herbs and aromatics and you’ll be really sad when it’s gone. And because two huge steaming bowls of ramen were not enough for me and my ramen-loving compadre, we also ordered some fried boneless chicken, because that’s how to do life right. The Wassup Bae fried chicken is perfect for fans of some heat—cooked to crispy perfection, the chicken is topped with house made wasabi mayo and wasabi crumbs, and yes, it will make your eyes water and your nose tingle. The #I’mNotTakoyaki fried chicken was the standout though, succulent and crispy chicken piled high with pickled ginger, mayo, takoyaki sauce, nori powder and bonito flakes, and no annoying bones to contend with. Y.U.M! The best news ever? 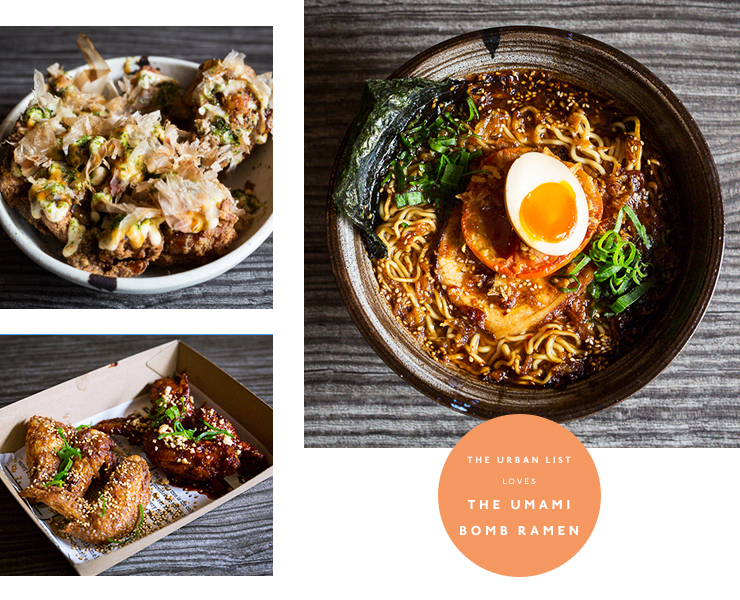 Eat Me Ramen Bar run their Eat Wings Night every Thursday from 5 to 8pm where you can pick up six wings for $5, 12 wings for $9 and 18 wings for $12—and you can mix flavours ‘til your heart’s content. Plus, if you check in, share, tag and post photos of Eat Me Ramen Bar’s delish food on Facebook or Instagram you get a free 63-degree egg with your order. Eggcellent! To top it all off, Eat Me Ramen Bar also makes gelato on site and they’ve churned out some pretty remarkable flavours in the past—we’re pretty darn sad we missed out on the cheese tart gelato, so these guys are definitely one to watch in that department. Open Monday to Saturday from lunch until dinner, move this Perth ramen bar right to the top of your list, you won’t regret it!